Here's a batch of totes I worked on as a special order last month, that have just now made their way to their final destination. 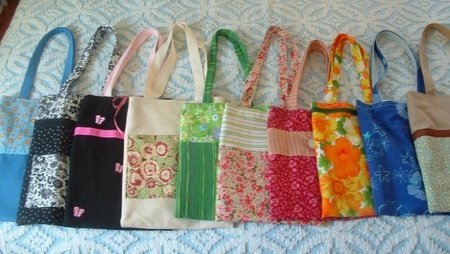 Working from my fabric stash, we put together these ten bags for her friends for Christmas. Isn't that such a thoughtful gift? And while I'm dredging up photos of bags I made last month, here's another that I haven't shared here yet. It was for mav of port2port (thanks for the image steal, mav!). This is my favorite, favorite vintage fabric that I'm ever so slowly letting go of. So yummy.